The Mach Bike is a medium-sized bike in Mario Kart Wii. The characters' emblems are shown on the front and the sides of the bike with a racing streak. The bike resembles a late-1970s racing bike and its name is a reference to the NES game Mach Rider, which feature racing on a bike while attacking opponents. Its kart counterpart is the Wild Wing. A similar looking bike appears in Mario Kart 8 and in Mario Kart 8 Deluxe called the Sport Bike. The Mach Bike features high speed, drifting, and Mini-Turbo: it is the second fastest medium bike in the game. Its acceleration is the lowest of all the medium bikes in the game. Its speed is tied with the Mini Beast. Its weight is tied with the Standard Bike M. Its drift is tied with the Quacker. Its acceleration is tied with the Spear, a large bike. It is also one of the the lightest medium bikes in the game. Mach Bike's design appears to be based on a Benelli 350, a classic Italian racing motorcycle from 1969. 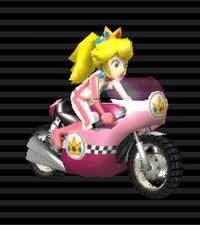 The bike's engine noise is later recycled for the Birthday Girl in Mario Kart 7. The Mach Bike has the same mini-turbo stat as the Bit Bike. This page was last edited on March 4, 2019, at 17:57.